Jessica Kensky and Patrick Downes are a married couple who were both injured during the Boston Marathon bombing in 2013. Jessica’s service dog, Rescue, joined their family in 2014. Jessica Kensky and Patrick Downes live in Cambridge, Massachusetts. 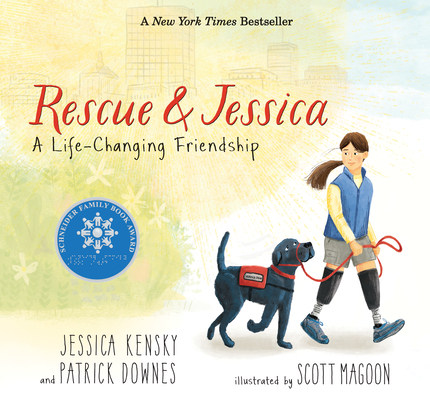 This riveting story about the relationship between a disabled girl and her black lab service dog is based loosely on Kensky’s own experiences as a double amputee...Throughout, the reader is treated to fascinating details on the many tasks service dogs can accomplish and, more important, how Jessica and Rescue saved each other. An inspiring tale of compassion and perseverance. Magoon uses dark backgrounds to symbolize Jessica's sadness and fear, but scenes with Rescue are open and bright; with Rescue nearby, even the night after her second amputation is lightened (via lamplight and stars). An authors' note reveals that both are survivors of the 2013 Boston Marathon bombing and includes information on National Education for Assistance Dog Services, the organization that trained Rescue. A gentle introduction to service dogs and acquired disability. The quiet and stirring text pairs beautifully with the art, which uses color and white space to convey time, meaning, and emotion with great effect...In the main text, Jessica’s injuries are not explained; the story instead focuses on the power and comfort that comes from her relationship with her service dog. Renewal of a more poignant sort transpires in the affecting pages of “Rescue & Jessica”... Scott Magoon’s colorful digital illustrations are pitch-perfect here: detailed enough to convey a sense of reality, yet softened and stylized in a way that will make the emotional intensity bearable for children ages 5 to 9. Young readers may also be delighted by the tasks that Rescue and dogs like him can perform, from fetching a ringing cellphone and opening the fridge to knowing exactly when his human needs consolation. —Kendal A. Rautzhan's "Books to Borrow"